Because of its shape and isolated geographical position, the main road network of Monte Subasio runs along its borders with SS road 75 linking Foligno to Perugia in the west and SS road 444 Assisana reaching Gualdo Tadino in the north. Not far on the south-eastern side there is also SS road 3-Flaminia. The roads leading to the Park are mainly represented by the roads connecting the historical towns of Assisi, Spello, Nocera, and Valtopina with the minor towns situated on the mountain. These roads have a mainly tourist function, as for the road connecting Assisi town center - Porta Cappuccini with Eremo delle Carceri, San Benedetto Abbey, and the summit of the mountain. Leaving from Assisi, exactly from Porta Perlici, taking SS road 444 first and then turning right, you will find Cà Piombino, housing the Park Headquarters. Going ahead and climbing to Costa di Trex you will reach Spello: along the way you will touch the minor historical towns of Armenzano, San Giovanni, and Collepino. The mountain road connecting Assisi with Spello and following the ancient carriage road is important. 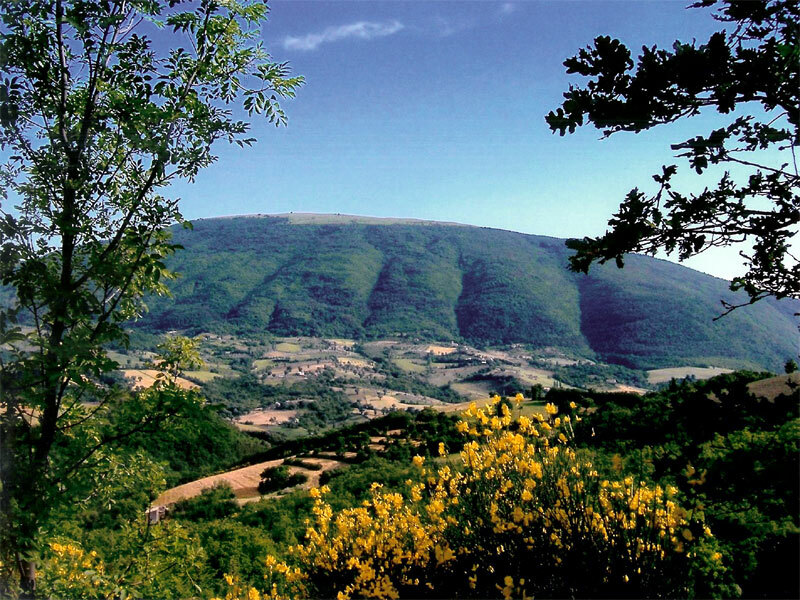 It is a panoramic road busy with tourists to reach Stazzi mountain grasslands on the slope of Assisi and Madonna della Spella Sanctuary on the slope of Spello. Along this trail you will also find Mortaro Grande and Mortaro Piccolo, dry dolines lying near the top of the mountain. They were used in the past to produce ice by pressing snow and preserving it till summer. Besides the main roads you can go along by car - respecting the limits involving the mountain road for environmental protection needs - there is a network of paths you can go along on foot or on horseback, mainly leaving from the towns of Costa di Trex, Armenzano, San Giovanni, and Collepino, giving the opportunity to reach the summit meadows. 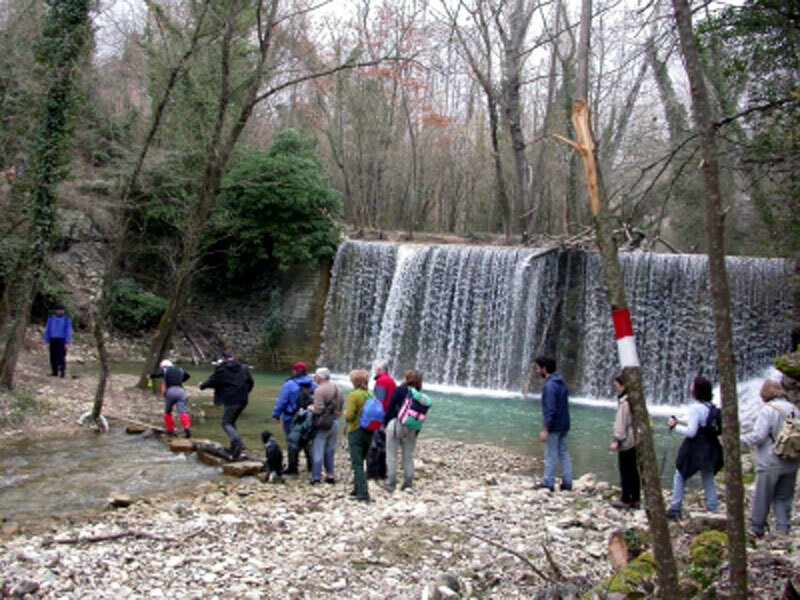 The itineraries crossing Subasio Park represent an occasion for a thorough knowledge of the geomorphology of the mountain of Assisi and its karst nature. They are also a way to discover from close up the naturalistic and historical-architectural main features of the territory and, above all, to directly touch the Franciscan spirituality characterizing the town and the mountain. Texts and photos are taken from Parco del Monte Subasio, Quattroemme, Perugia 2006. All rights reserved. Regione Umbria, thanks to a project carried out in collaboration with the regional CAI sections, has recently surveyed in the Park the following itineraries. Monte Subasio Park and C.A.I. (Club Alpino Italiano) - Section of Foligno work together in order to improve and develop the existing trails, contributing to its maintenance and conservation. 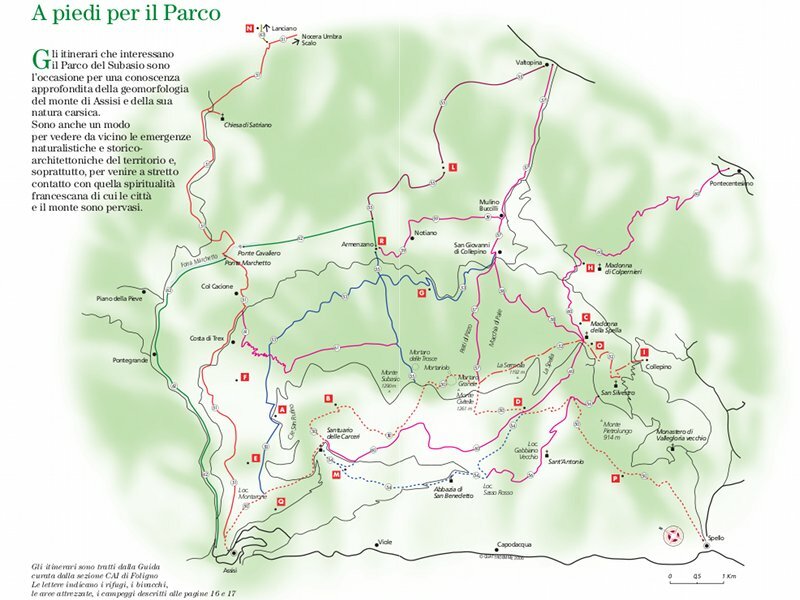 Thanks to regional funds, they have collaborated in the past to the publication of a carta dei sentieri (map of the trails) containing fourteen trails that have been planned and organized by the C.A.I. volunteer members with the help of GPS equipment; for this reason, this map is one of the most reliable products in the field. There is an ongoing measure aiming at placing vertical markers at the departure points and crossroads of the trails. 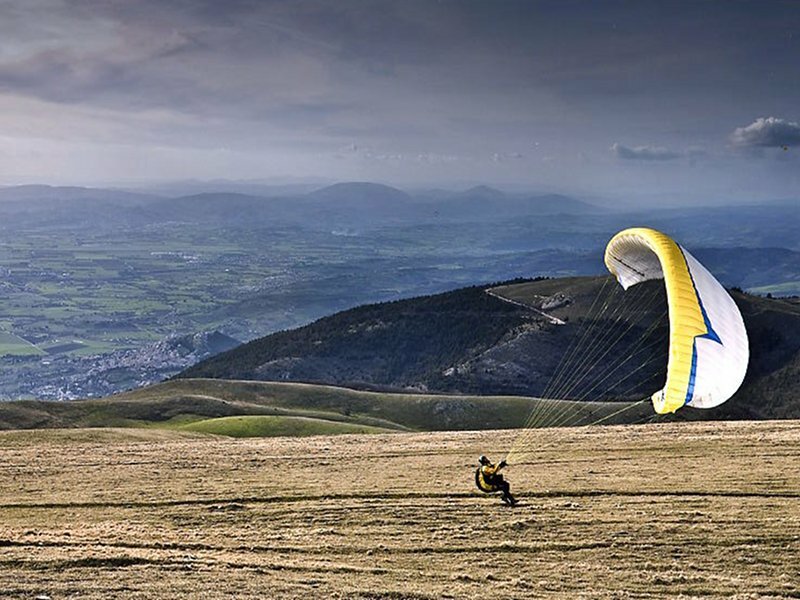 Mount Subasio, whose summit reaches an altitude of 1,290 m above sea level, is a spectacular flight area for paragliding in the sky of Assisi. Thanks to its side location it is the ideal place for flights at an altitude of more than 2,000 m above sea level. The flight area has five take-off areas, climbing down the North, East, South, West sides and two landing areas which are easily reachable by car or by shuttle bus. The club placed a sint-wind near the take-off areas, which can be reached by calling the number +39 338 6613344. The difference in height among the most frequented take-off areas, the southern (1,250 m above sea level) and the western (1,277 m above sea level) ones and the official landing area of Rivotorto di Assisi is about 1,000 m. With good weather conditions, flying over Assisi with the view of the Trasimeno lake and of the Apennines is a breathtaking experience, and flying will be easy for any pilot.